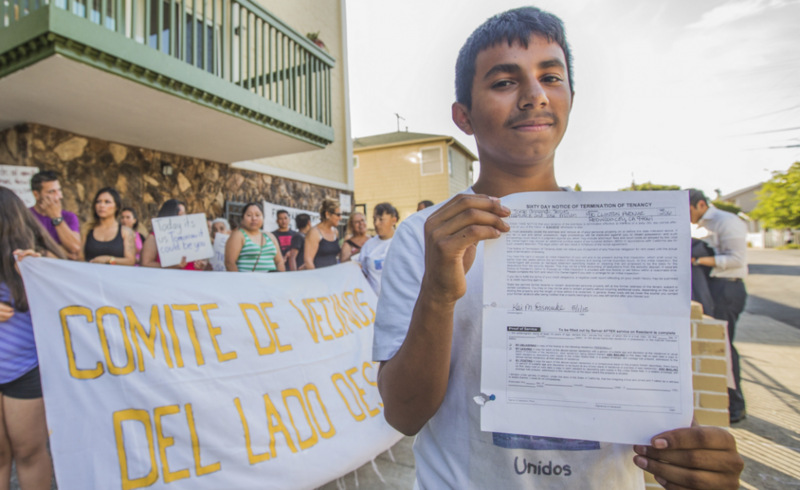 “Evicted Redwood City tenants rally to stay in complex as calls grow for renter protections” announces the headline, with a photo of 14-year-old Gabriel Banuelos holding the eviction notice for the 18-unit apartment complex . But why would this happen in “Deadwood” City (the long-standing local nickname for the moribund downtown area)? As findings from our Urban Displacement Project show, a variety of neighborhood conditions — such as proximity to rail stations, historic older housing, new market-rate development, and rising housing prices — can increase the risk of displacement. Redwood City is still more affordable than many of the affluent Peninsula neighborhoods surrounding it. Consistent with its historic role as a home for low- and middle-income families, the community gained 724 new low-income households from 2000 to 2013 (an average of 42 households per census tract, compared to a region-wide increase of 59 households per tract). However, like the rest of the region, it is losing “naturally occurring” affordable housing – older housing that has filtered down from high-income households as its quality declines, and for which low-income residents pay less than 30% of their income in rent – and losing it more quickly than it can build new units. From 2000 to 2013, the city lost 1,594 naturally affordable units, over half of which were located near the Caltrans rail station, while building just 569 new market rate units. Redwood City can do better for its residents. It is fortunate to be part of San Mateo County’s 21 Elements, one of the region’s model collaborations. This collaborative of planning department staff from the county’s 21 jurisdictions shares information and best practices related to the Housing Element, and nudges members like Redwood City towards providing and preserving more affordable housing. By working together on the region’s housing crisis, cities can coordinate policies and resources needed to provide more affordability. Such regional collaborations provide one path to reducing the inequality that divides our region. Redwood City can harness this resource to take the lead towards a more equitable future. Property owners are not suffering with 50% to 100% rental increases. Give me a break! I am a property owner. I know what costs are. These apartment owners are just plain greedy! I know the business. They are blackening the name of fair property owners. It is ridiculous!! In a word: Baloney! Read statistics. Get some compassion. Redwood City is a holding ground for low income people (many unskilled and illegal) and has been for years. The rental market is ever changing and when new owners purchase an existing property their tax base is moved up the new reassessed property tax value. These protesters have been spoiled for years with below-market rent and this is the fault of property owners that don’t incrementally raise the rents annually. Saw the rent control advocates protesting today, which was beyond ridiculous; they demonize the landlord but only see things through their own eyes. If a landlord cannot get money out of a property, how can that landlord put money into it when it needs it, especially a multi-family dwelling property. Better quality rentals catering to higher income people not only sustains a higher revenue source for the City and County. Rent control is a disaster for landlords and tenants alike, just look at San Francisco. What is really strange is there is a complex there off El Camino which is a subsidized HUD Housing multi units and you see plenty of young families and nice new cars in the parking garage. Strange because what was once a type of housing that was for handicapped and elderly is now packed with able bodied young people on government subsidies. Nice cars and motorcycles though. Supply and demand dictate price…If you cant afford do not buy….artificially supporting demand by government just makes it worse… Yes I want to live in Portola valley or Atherton. but I cant afford it so I live in Redwood city. Can’t afford Redwood City? Then move to Stockton? If government wants to help the community I suggest they look at ways to reduce the tax burden put on its population, cut its budget.